"Philokalia" means "love of the beautiful and good". It was the name given to a celebrated 18th-century collection of Greek mystical texts on the Christian spiritual life, teaching the path to true sobriety and the fullness of union with God. This "Little Russian Philokalia" is a new collection of ascetic texts drawn from Russian sources, chiefly of the 18th through the 20th centuries. 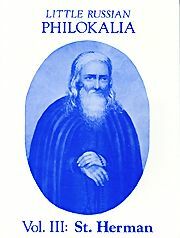 The third volume is devoted to St. Herman of Alaska (?1836), who brough the original Paisian "Philokalia" to America and drew his converts to sanctity. Softbound. 200 pp.